Hello everyone! 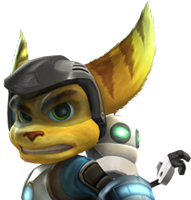 On the 29th of October, I'll be at MCM London Comic Con, and I'm working on a Ratchet and Clank cosplay. It will include a Clank backpack, galactic ranger armour, the ears and tail. I'm posting the images to DeviantArt as I make progress, so check it out and follow for updates. I also include the materials I use in the image descriptions. If anyone's going to MCM London on the Saturday, be sure to say hello and take a selfie with me. Cool. Might follow updates from your DA account, then. I'm back from MCM, and everyone loved the cosplay! 14 people asked for photos, including some StarFox cosplayers in fursuits!